Me in Toadstool Geological Park in 2014. People always ask me if I have discovered any "favorite places" in my decade of travel. As I have traversed the globe, a few places stand out among the rest. One of those places is a little known park tucked into the northwest corner of Nebraska - Toadstool Geological Park in the Oglala National Grasslands. Toadstool is a series of otherworldly limestone formations in the badlands of America. I first came out to Toadstool in the summer of 2014 as part of our initial production on the Nebraska Project. Christine Casey and Dan Edwards were along to assist and to see what life on the road looked like. Our first few hours at the park were a mixed bag. We arrived to soft clouds and blue skies and quickly set up a Cinevate motion controlled timelapse at the first formation we found. Then, for a reason I can't remember, Bill and Christine left with the minivan - likely to download a card or charge a battery at the guest ranch house we were staying at a couple miles away. Not long after they left the wind picked up and the sky turned from friendly to angry, throwing sand and rain at Dan and I before we could process the change in weather. About 20 minutes later Bill and Christine returned to find Dan and me soaking wet and fuming mad. Clearly, we got past it and production continued. Toadstool was featured heavily in our “Nebraska Skies” video. From a distance, the park looks like miniature mountains that somehow ended up in the plains of Nebraska. The short gravel path that leads from the parking lot to the formations is underwhelming; the sandstone ahead looks flat, the grass brittle. Then a corner turns, and the mushroom-like formations created over centuries of wind, rain and ice decay rise ahead. Toadstool Park, taken this morning under a blue sky. It's a path and a sight I am now familiar with, but three years ago I felt as though I'd stepped off a space ship and onto another planet. 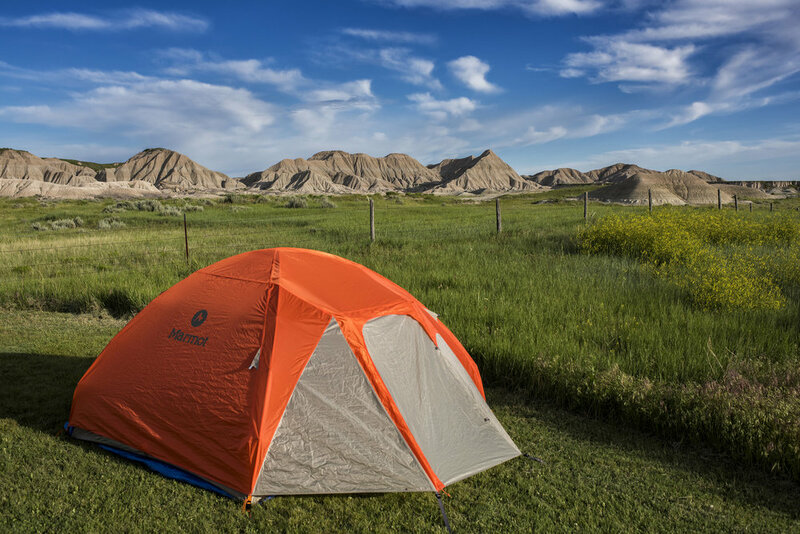 This weekend the Nebraska Project crew will be camping in Toadstool, working in the surrounding area by day and capturing time-lapse by night. My home for the next couple days. It's a peaceful place to sleep - 50 degrees in the dead of night in the middle of June. The only sounds are a lonely coal train and distant coyotes, joined by the ever present mix of whippoorwills and prairie finches, a gentle breeze constantly blowing. A toadstool formation lit by the half-moon light, a shooting star in the distance. One of 700 frames from last night's time-lapse. The rest of the world feels far away.